Follow on Pinterst! Become a fan! It is hard to believe that there is only 2 weeks left of Spring! Don't panic, there is still time for spring cleaning! Time to clean out the closets and get rid of the clutter. 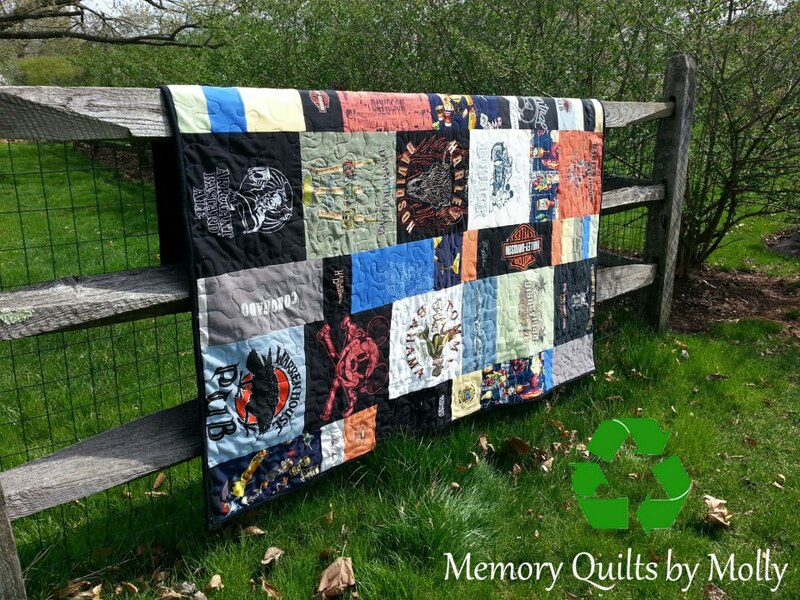 Why not have a beautiful Memory Quilt made out of that pile of t-shirts that you simply can't part with? It is a win-win! You get rid of old clothing and award yourself with a gorgeous keepsake filled with cherished memories. This past Earth Day reminds us to Reuse, Reduce, and Recycle! Who knew recycling could be so beautiful? 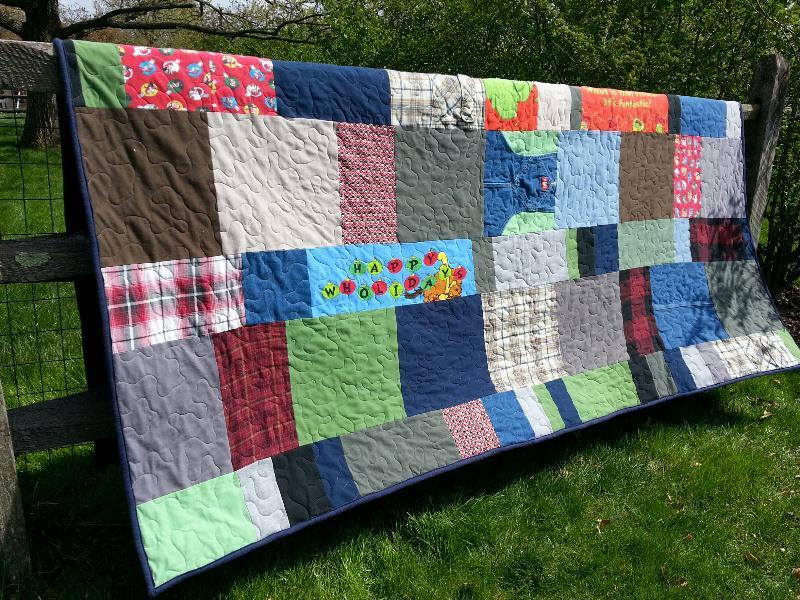 This newsletter is dedicated to the many graduation and birthday quilts that I have made this past month! It is gratifying to know that I have wrapped many of you in your loving memories! Thank you for subscribing. Your support means everything to me. If you are in need of a Memory Quilt for any occasion please contact me. Quilts are now taking 10-14 weeks. Ask Debbie Lillard, a Professional Organizer, located in Philadelphia! She recommends having a quilt made (mine of course) to reduce the clutter and organize your life! 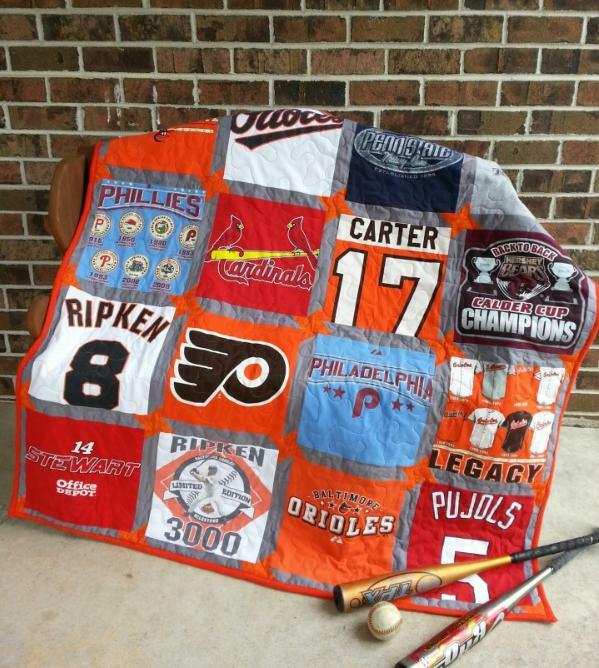 This quilt was made with a dedicated fan's Orioles, Cardinals, Phillies, Flyers, and Cal Ripken shirts! This premium, traditional style, lap quilt measures 54" by 54". Classic orange and gray colors in the sashing really make this quilt pop. 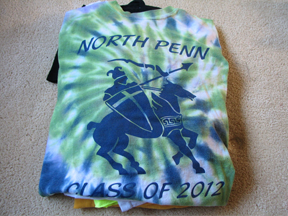 Made with North Penn blues,and a little pink too! 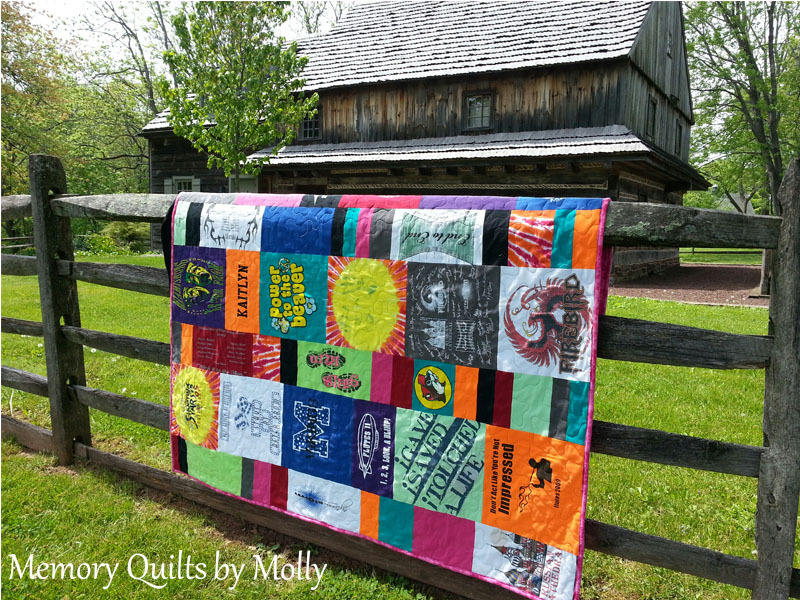 Anyone who has ever stitched, admired, or snuggled with a quilt knows, quilting has a history steeped in resourcefulness, storytelling, community and warmth. I would be pleased to make a quilt from your memories. Are perfect together in this Modern style lap quilt that measures 68" by 73", which is a very generous size lap quilt. A speckled maroon cotton backing was selected to compliment the colors in the quilt. 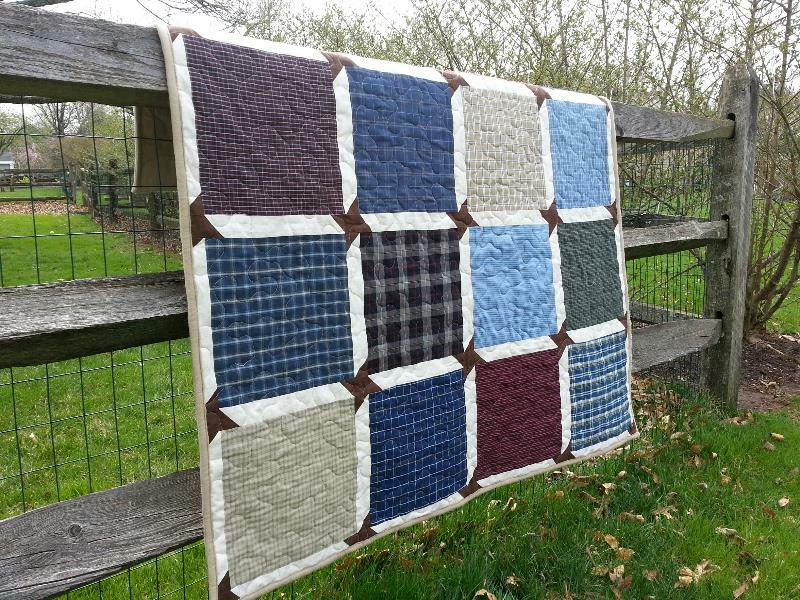 This traditional style lap quilt was made from plaid, cotton, button down shirts! Not one single t-shirt was used! The sashing has a beautiful circular pattern that contrasts the plaids beautifully. Shown here are three of the four style of quilts that I offer. Each one is unique and beautiful. The Modern Quilt on the left is very popular with the younger crowd. The Block Quilt in the middle is good if you have garments other than t-shirts like cotton, button down shirts. The Traditional Quilt on the right is a very classic quilt good for shirts with large graphics. This Queen size Modern Quilt measures 95" by 108". It is huge! A favorite pair of denim overall was added (both the front bib and the back bib) as the focal point of the quilt. These overalls are surrounded by many other favorite shirts. It was backed with a super soft, navy blue flannel. 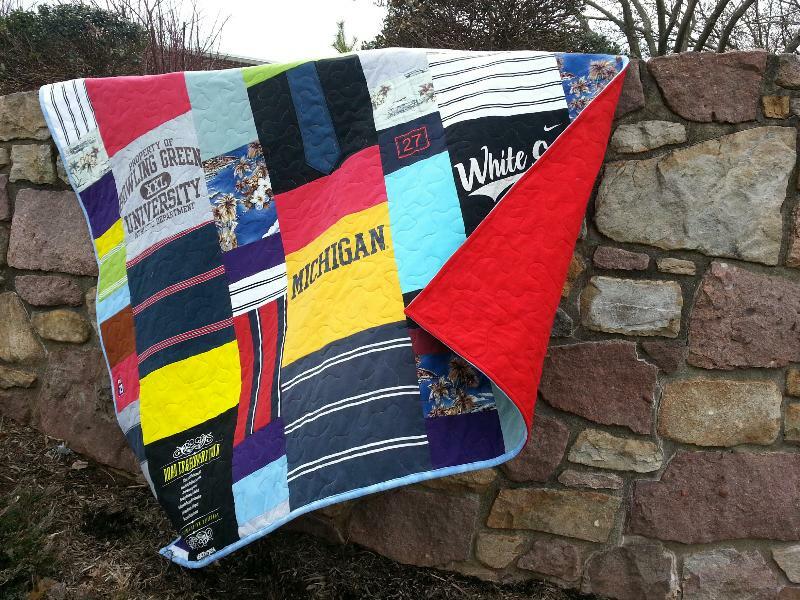 This Modern style lap quilt measures 68" by 73", and is a perfect graduation present! 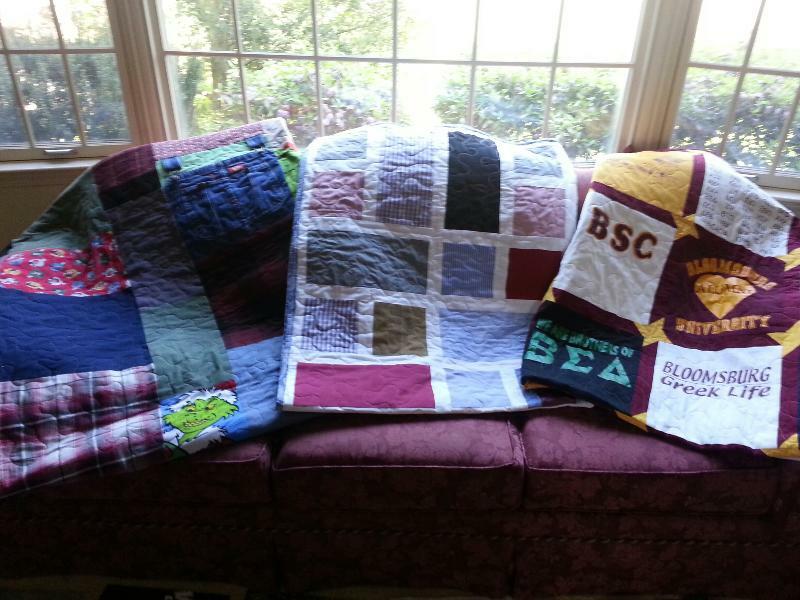 Many graduates will receive Memory Quilts this year! For those of you that may have missed it! 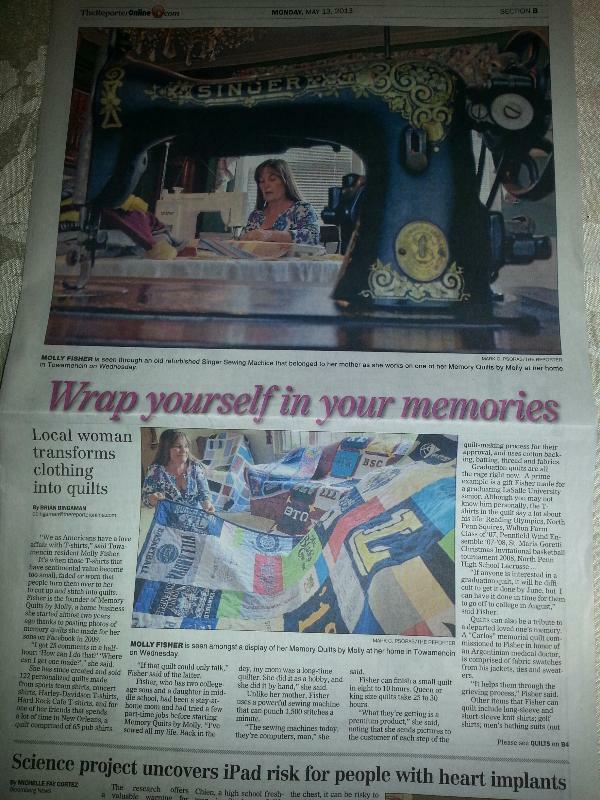 Memory Quilts by Molly was featured in the North Penn Reporter on May 13, 2013. It was a very exciting day for me!